Exceptional Golf Tours Queenstown-Lakes and the beautiful Central Otago region. PGQ is a leading golf tour operator providing Queenstown golf tours for singles, couples, groups of mates and golfing tours for seniors. Holidays and package options include indicative pricing to provide you with an idea of what the tour will cost. Stephen Jensen is a seasoned golf tour host. His company PGQ has been booking and arranging escorted tours in the area since 2005 - he's the perfect host and provides access to all golf courses in the Lakes District and Central Otago region. You can customise your golf trip or golfing tour Queenstown to fit your exact requirements. This amazing tourist town has almost unlimited accommodation options available. Whether you're planning a short stay or several weeks and whatever your budget we'll find the perfect property for a perfect golfing holiday. Queenstown and the rest of New Zealand is quickly becoming a major world golfing destination, we have the NZ government amongst others to thank for this. So before you book your golfing trip of a lifetime don't take out word for it, here's what Tracey Walters of Bloomberg had to say about New Zealand looking to golf tourism to boost foreign visitation in New Zealand. Contact Stephen Jensen on +6421784339 to discuss your requirements. Upon arrival your party will be met at Queenstown International Airport by your golf tour operator (PGQ) and transferred to your holiday apartment or hotel accommodation. Arrival time TBA. The first part of your golf tour is set within a 3000 acre nature preserve on the shores of Lake Wakatipu this 18 hole 72-par golf course is designed by John Darby, of Darby Partners. 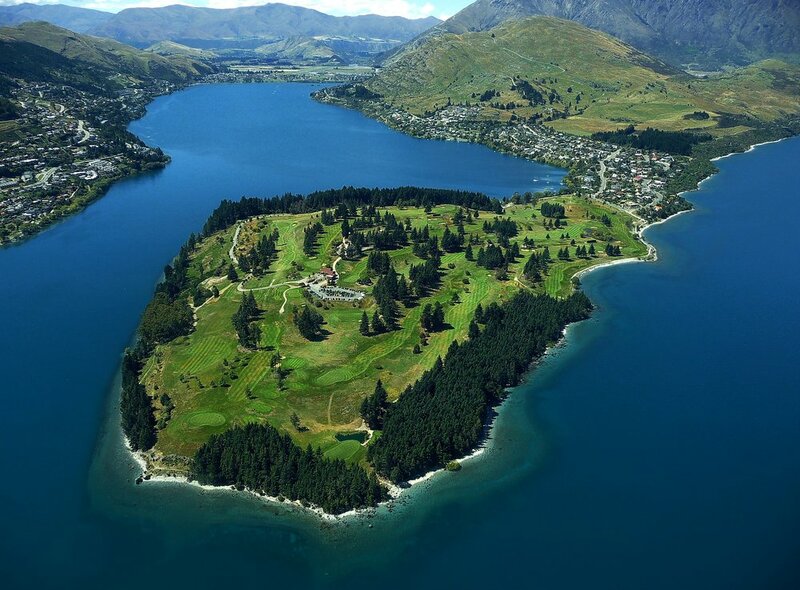 The Jacks Point golf club is bounded by the Remarkables Mountain Range and Lake Wakatipu. It traverses through wetland to the Lake edge encountering steep bluffs, indigenous vegetation and wildlife. It is designed to work with nature, not against it. Fairways are designed with minimal excavation and careful plantings to complement the natural environment, but also to give golfers a fighting chance. Set in a natural, alpine amphitheatre, the Millbrook golf course exploits the dramatic terrain fully, delivering world-class golf. Millbrook is quite simply a fantastic golf resort. The 18-hole, par 72 championship course was designed by renowned professional and master golfer, Sir Bob Charles. It features four different tee positions for complete enjoyment at all levels of playing expertise. Challenging for both higher and lower handicap golfers, the Millbrook Resort course is one of the most impressive international golf arenas in the world. Featuring impeccably groomed fairways and greens, demanding hazards and meandering water courses, surrounded by the alpine backdrop of the Remarkables Mountain Range, golf at Millbrook Resort is an exhilarating experience. Queenstown Golf course at Kelvin Heights was recently voted New Zealand’s most scenic golf course and is internationally regarded as one of the World’s most picturesque. It is set in the amphitheatre of the famous Remarkable Mountain Range and surrounded by the pristine waters of Lake Wakatipu. The course is ‘truly awesome’, offering not only a course that will test your skill but provides a golfing experience you will never forget. Queenstown Golf Club provides a unique challenge with undulating fairways framed by well-established Pine trees. The signature 5th hole playing across the Lake is one of New Zealand’s finest and most photographed. The course offers one of the higher slope ratings in New Zealand to test all golfing abilities. Your day starts as soon as you pull into the car park and see the clubhouse; the view from the balcony alone guarantees you a remarkable day of golf. PGQ's scenic golf tours are not to forget so don’t forget your camera! Set within a 3,000 acre nature preserve on the shores of Lake Wakatipu this 18 hole 72-par golf course is designed by John Darby, of Darby Partners. The Jacks Point course is bounded by the Remarkables Mountain Range and Lake Wakatipu. It traverses through wetland to the Lake edge encountering steep bluffs, indigenous vegetation and wildlife. It is designed to work with nature, not against it. Fairways are designed with minimal excavation and careful plantings to complement the natural environment, but also to give the golfer a fighting chance. At the end of your golf trip your party will be collected from your holiday apartment or hotel and transferred back to Queenstown International Airport. Below are examples of some of the quality hotels and accommodation available when booking your Queenstown golf tour with PGQ. However, please note that we are able to offer access to a much wider range of hotels, motels and other accommodation to meet your requirements and your budget. Just click on the 'Learn More' links below the images to view information about the hotels and package prices. 6 night accommodation package at the Novotel Lakeside From $1,365.00NZD per person. 6 night accommodation package at Peppers Beacon Hotel From $1,385.00NZD per person. 6 night accommodation package at Hilton Queenstown Hotel From $1,525.00NZD per person. 6 night accommodation package at Millbrook Resort From $1,395.00NZD per person. 6 night accommodation package at Kawarau Hotel From $1,245.00NZD per person.